In an era when baseball players were supposed to be upper-class gentlemen and amateurs, Doug Allison didn’t fit the mold. He came from working-class origins and he was one of the first players to turn professional. Allison introduced two innovations that now are universally followed by all modern catchers. Douglass1 L. Allison was born in Philadelphia on July 12, 1846, sixth of the seven children of Elizabeth Clark Allison and John Shaw Allison, a weaver. Both of Doug’s parents were immigrants – his mother came from Scotland around 1818 and his father from England about 1827. They met and married in Philadelphia. Doug grew up in Manayunk, a working-class area in the northwestern part of Philadelphia. (The family lived briefly in rural Cecil County, Maryland, around 1860.) There is no record of his ever having played baseball as a child. That report is not accurate. During Allison’s time of service, the 192nd was never engaged in combat or ever stationed at Fort Sumter. However, it engaged in heavy artillery drills at Fort McHenry in August 1864.3 Heavy artillery firing can cause significant hearing loss, whether in combat or practice. 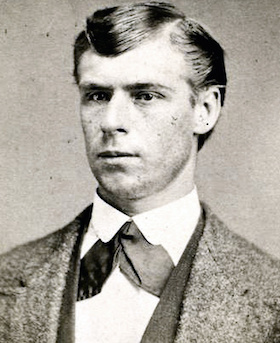 It has been erroneously reported that Doug and his brother, Arthur, who also later played major-league baseball, served in the same unit during the Civil War and learned baseball from fellow Union troops. The roster of Company L lists Doug and an older brother, Albert, as members of the unit. But Arthur was only 15 years old at the time and therefore probably not in the Union army. Catching was hazardous duty in baseball’s early days. No catcher wore gloves, chest protector, mask, shin guards or any other protective gear. Broken fingers, gnarled hands, mashed toes, and chipped teeth were visible marks of the trade. Catchers stood about 20 to 25 feet behind home plate and tried to catch pitches on the first bounce. They also had to contend with foul tips, errant swings, thrown bats, and baserunners crashing into them. As the advantages of moving closer to the batter became obvious, other catchers followed Allison’s lead. Soon the practice became universal. In 1868 Allison played for a strong amateur club, the Philadelphia Gearys. Scouting for prospects in the area were John Joyce and Alfred Gosham, two officials of the Cincinnati Base Ball Club. They had a special need for a catcher who could handle the fastballs slung plateward by Asa Brainard from the pitcher’s box only 45 feet away. Allison was catching for the Gearys that day. Not only did he handle himself well behind the plate, but he also hit a long home run to center field in his first at-bat. Impressed, the Cincinnatians invited him to their hotel room after the game. In walked a tanned, freckle-faced, scruffy appearing, poorly-dressed young man in a straw hat. Joyce and Gosham got him a haircut, bought him a suit of clothes, and took him back to the Queen City with them. The Cincinnati Base Ball Club was still supposed to be an amateur outfit in 1868. In order to maintain the ruse, the players who were imported from the East were given jobs in the businesses of the team’s backers. They reported for work every morning, were visible to callers, and were paid small salaries, although many of them did little, if any, work. They could pretend they didn’t play ball for a living.6 Allison was given a job as a granite cutter, a trade for which he was qualified from his previous work in Philadelphia. How much granite he cut in Cincinnati is not known. Owned by Aaron Burt Champion and managed by Harry Wright, in 1869 Cincinnati became the first baseball club to openly pay salaries to all of their players. Called the Red Stockings in recognition of the knee-length crimson hose the players wore, the club became the most dominant team ever to play the game. They defeated all their challengers in the Midwest, conquered the best teams in the East, and swept a Western tour, winning 56 or 57 games7 in that undefeated season. One time that George Wright did replace Allison behind the plate was in a June 24, 1869, game in Baltimore. Allison was hit over the left eye by a foul ball. Wright took over catching duties, and James Fowler replaced him at shortstop. Fowler was the team’s scorekeeper. He does not appear in the team photo or on their roster, but he played three innings in that game. Allison’s fear of ridicule was well founded. In the macho world of nineteenth-century baseball, wearing a glove was considered unmanly. Unlike Allison’s first innovation, this one was slow to be adopted. The best fielding infielder of the 1880s, Bid McPhee, played nearly his entire career without donning a glove. Eventually, however, the need for self-preservation outweighed the desire to appear tough, and wearing gloves while fielding became de rigueur among all baseball players, not just catchers. The glove has evolved to the point that today’s article would have been unrecognizable to Allison and his contemporaries. On June 14, 1870, the Red Stockings winning streak came to an end as they lost to the Brooklyn Atlantics in a hard-fought game, 8-7. After the loss, dissension on the club, which had been muted during the glory days, came out in the open. Two cliques emerged, divided over drinking and discipline. The Wright brothers, Gould, and McVey opposed what they considered rowdy behavior; the others had a different opinion, particularly about off-field conduct, and objected to Wright’s strict discipline. During the controversy, President A. B. Champion resigned on August 2, as did Vice-president Thomas G. Smith and Secretary John P. Joyce. All three officials claimed demands of their private businesses prevented them from giving sufficient attention to baseball responsibilities. The amateur Red Stockings had incurred a deficit of $6,000 in 1868.15 In 1869 the professional club showed a small profit and gave each player a $50 bonus as a reward for the undefeated season. The club paid $9,300 in salaries to the starting nine and a utility player. Doug Allison received the median salary of $800. In 1870 it was still mid-season when Champion resigned, so the final balance sheet was not yet available. But attendance was down, expenses were up, and other professional clubs were trying to entice players away from Cincinnati. Club officials estimated it would require some $16,000 to $17,000 to cover the costs of player salaries, grounds upkeep, equipment, uniforms, and advertising in order to keep the club afloat for the 1871 season.16 Raising that amount of revenue did not seem possible. The first openly all-professional club in the history of baseball had reverted to amateur status. Meanwhile, a new professional baseball club was established in Boston, and its owners offered Harry Wright the positions of manager, captain, and secretary. On November 30, Wright accepted the offer. He was invited to bring other Cincinnati players to the Hub. George Wright joined his brother in Boston, as did Charlie Gould and Cal McVey. Wright did not pursue the others, for he wanted no drinkers, “growlers, or shirkers”18 on his team. Wright considered Allison disqualified on all three counts. Although Wright didn’t want the dissident ex-Red Stockings on his team, other baseball executives were not so discriminating. The first major league, the National Association, held its inaugural season in 1871. Doug Allison and four of his Cincinnati teammates signed with the Olympics of Washington, D.C.
Allison hit .331 in the nation’s capital, the highest batting average on the club. It was in fielding, though, that Allison’s star shone most brightly. He led the league in double plays by a catcher in his first season and ranked in the top five four additional times. He led the league in fielding percentage twice, was second once and third once. He ranked in the top five in range factor and putouts four times each, and in assists twice. Most of these achievements did not come with the Olympics, however. In the next four years he played for five different clubs: Troy Haymakers; Eckfords of Brooklyn; Resolutes of Elizabeth, New Jersey; Mutuals of New York; and the Hartford Dark Blues. In 1873 he managed the Resolutes for 23 games, compiling a horrific 2-21(.067) record. The National Association folded at the end of the 1875 season, and Allison accompanied the Dark Blues into the new National League. He played two years for Hartford and parts of two seasons for Providence. In 1879 he was back in this National Association, which by then was a minor league. He divided the season between the Capital City club of Albany and the Rochester Hop Bitters. At the end of the 1879 season Allison’s career in professional baseball was interrupted for three years. In 1880 he was working as a stone cutter and living in Bucyrus, Crawford County, Ohio, with his wife Catherine (nee Hoffman), whom he had married in Butler, Ohio, on March 6,1872, and their three-year-old daughter, Blanche. On January 21, 1880, a newspaper reported that Allison had written a letter to the managers of the Cincinnati club, asking them to engage him as a change (i.e., backup) catcher.19 However, the letter did not accomplish its purpose. By 1882 Allison was back in Washington playing baseball with a semipro club sponsored by the U.S. Post Office. Allison returned to the major leagues for one final game with the Baltimore Orioles of the American Association on July 13, 1883. He had a good day at the plate, going two-for-three and scoring two runs. Errorless in the field, he caught five innings and played two innings in the outfield. But at the age of 37 he had played his last game in Organized Baseball. In the 1900 census Allison was identified as a government clerk. The 1910 census specified that he was a clerk for the U. S. Post Office. He worked for the Post Office the rest of his life. Despite his reputation for self-centeredness as a player, Allison was capable of empathy and compassion for others. For example, his teammate from the 1869 Cincinnati Red Stockings, Cal McVey, had fallen upon hard times. His home had been destroyed and his wife seriously injured in the San Francisco earthquake of 1906. Later McVey was working at a mine in Nevada when a 30-foot fall crippled him. For a time McVey lived in a small shack, depending upon charity for food and clothing. In 1914 Allison wrote to Garry Hermann, president of the Cincinnati Reds, asking if his old teammate might be given a small monthly pension: “He helped put baseball on the map…and was one of the greatest players of his day.”21 McVey was given a small allowance. Douglass Allison died on a Washington sidewalk near his home on December 19, 1916, while walking to his job at the Post Office. He was 70 years old. According to his death certificate the primary cause of death was endocarditis, an inflammation of the inside lining of the heart chambers. The immediate cause was acute cardiac dilatation. He was buried in Washington’s Rock Creek Cemetery, near other family members. The writer wishes to express his appreciation to Susan Welch, who provided much helpful information about the Allison family. Pete Palmer and Gary Gillette, eds. The Baseball Encyclopedia, New York: Barnes and Noble, 2004. The Baseball Encyclopedia,, 9th ed. New York: Macmillan, 1993. 1 Most reference books spell his name with one s. However, early census reports and his tombstone use the Douglass spelling. 2 Boston Globe, March 24, 1876, cited in baseball-fever.com. 4 Stephen D. Guschov, The Red Stockings of Cincinnati. Jefferson, NC: McFarland, 1998, 30. 5 Doug Allison, cited in http://baseballhistorydaily.com/tag/doug-allison. 6 John Thorn, Baseball in the Garden of Eden, New York: Simon and Schuster, 2011, 144. 7 The Red Stockings won 56 games outright. The game against the Troy Haymakers on August 26 ended in a 17-17 tie when the Haymakers left the field in protest of an umpire’s call. The Red Stockings claimed a victory by forfeit. If that win is counted, the Red Stockings had 57 victories in 1869. 8 Richard Puff, “Douglas L. Allison,” in Frederick Ivor-Campbell, Robert L. Thiemann, and Nark Rucker, eds. Baseball’s First Stars, Cleveland: Society for American Baseball Research, 1996, 2. 9 George Wright, cited by Guschov, 32. 10 James Fowler, cited in http://baseballhistorydaily.com/doug-allison. 13 Cincinnati Commercial, cited by Guschov, 118. 14 Cincinnati Gazette, cited by Guschov, 118. 19 New York Tribune, January 21, 1880. A change player in the nomenclature of the era was a substitute or back-up player. 20 Macon Telegraph, June 20, 1891.